By far the highlight for many of us at the NAACE Hot House event earlier this week was the presentation by Torsten Stauch from Appshed.com. Torsten put a good deal of effort into his presentation and made every attempt to show linkage between his online tool for making free web apps and the new NAACE Framework. Though his talk was interesting and a good attempt at linking curricula with product, it was the tool itself that excited us. It slowly dawned that this was a powerful and easy to use application that allowed users to drag and drop elements to form a usable and very credible web app. While Torsten spoke I tried this out and within ten minutes had made a daft but credible app that displayed a Youtube video in one tab, some news in another and a flickr photo set in another. All done by dragging and amending existing modules/ extensions from Appshed’s growing library of web building blocks. Let’s be clear Appshed lets you and your pupils create a web app – that is a mini/mobile website in essence. You can create an icon which you can choose to pin to the front screen of your phone or Ipad and essentially run this as a website or webapp on your Android, Iphone, Ipad or Blackberry Device. This amazingly is free! However, if you want to publish your app and package itdo that ready for an app store or market place, then you will be charged. I remember soon after joining 2Simple I made an app, to pull news feeds, photos and videos into one easily navigable set of tabs. This used a site called appbuilder, and though slightly similar to Appshed, there were disadvantages. You had to publish your app and the publishing process was quite confusing with multiple versions, amending the app was also a headache and involved some costs. Furthermore I do not remember it being quite so intuitive as “the shed“. I have also dabbled for way too long with the Google/MIT object-oriented App Inventor, with some success. But App Inventor can take time for teachers to get their head around and most would not last the distance, that and the fact that it is designed for Android devices. Following the session, myself and colleagues talked about how we might use this in our classes. For some it was in clubs or with Digital leaders, others saw it slotting into teaching units in upper Key Stage 2. I gave it some thought and I am already beginning to see places where this would slot in to our creative and evolving curriculum. In Year Five for example, our children form and run their own cake companies. This is played out in a Mantle of the Expert approach and touches on speaking and listening, writing, internet research, spreadsheets and of course food technology. It occurred to me that each company within Year 5 would further enhance their work by creating an app to advertise what they did and as a means of getting orders. With this in mind I spend just under an hour pulling together a rough first draft. It did not take the hour at all to make the app, in fact what took the most time was sourcing some icons from my dear friend , Bev Evans and some cupcake images from a former pupil, who now runs Cupcake factory. 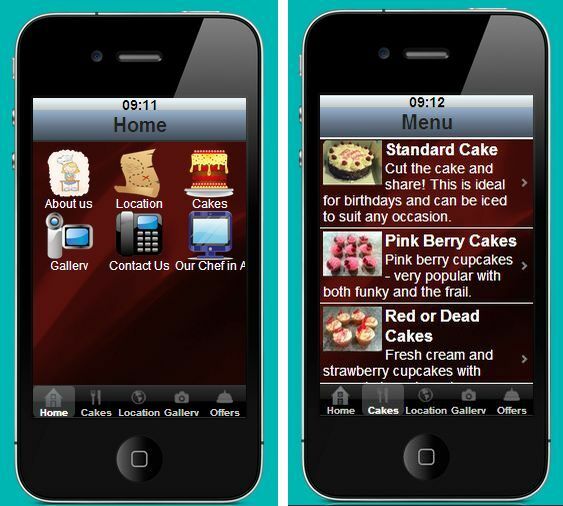 currently the app can allow viewers to see the range of cakes, email the office and watch a video of the “factory”. However there are other functions that could be included such as triggering the camera, perhaps for customers to take pictures of people enjoying their cakes. There is also google docs integration, so there are possibilities for the app to feedback too. Once you get going with Appshed you will quickly discover its potential through the expanding range of extension and functions. This means that you often change spec and design on the fly. The great thing is of course is that your work can be improved very quickly by republishing without hassle or fuss. So last night I published my app, viewed it on my Ipod and then went back to my PC to make tweaks and changes before republishing. A process of write, review/edit and amend which is a very familiar process within literacy lessons, but not always evident within ICT. Do copy this link into Safari on your Ipod or Iphone and choose to pin the url to your home screen, you will then get an idea of how it all works, and spot lots of areas for improvement too! Clearly making an app will attract a good deal of kudos for the pupils and teacher involved, but there are lots of implicit and explicit skills that i picked up on when I made one earlier today. Preparing and editing graphics so that everything is the correct size. Imagine the dramatic change which could be possible in just a few years, once we remove the roadblock of the existing ICT curriculum. Instead of children bored out of their minds being taught how to use Word and Excel by bored teachers, we could have 11-year-olds able to write simple 2D computer animations using an MIT tool called Scratch. By 16, they could have an understanding of formal logic previously covered only in University courses and be writing their own Apps for smartphones. I love AppShed and welcome your blog post. I am at an early stage with this as well and your feedback is encouraging. One minor point that I want to pick up on is the ‘Gove’ quote ‘the roadblock of the ICT Curriculum’, personally I don’t think it ever was a roadblock and everything in Appshed and all you’ve mentioned (in your 6 bullet points) fits in with the old PoS perfectly. Of course boring teaching is boring teaching – Appshed or Rasberry Pi isn’t going to change that – I agree that some teachers look for the latest gizmos to make their boring teaching seem OK.
Maybe I’m just lucky in being surrounded with some really creative schools and innovative ICT teachers. Hey Bob Thanks for commenting – prompted me to look over your blog and your impressive bio. I think we are mostly on the same page with things here, though my background is primary and so what I have seen may not fit with your experiences. Firstly the Gove quite is slightly ironic, I am glad he raised the points about ICT back at Bett this year, but I am not sure he really knew what he was saying. At primary Level all my points and indeed Appshed would fit with the current POS. The problem comes in the exemplification materials for the curriculum which many teachers still look to as being law. Coding in general in primary has in many cases been Logo and a an appropriate control program such as Flowol. A few mavericks have dabbled in Scratch or Kudo, but its taking a while for these to be mainstream. The new freedom we have with no fixed POS for the next couple of years will hopefully breed innovation in curriculum design and a wider variety of IT experiences. Have you Read? – – This much I know about…why we should never grade individual lessons again! Julian Coultas – Apple Education Mentor. QR code from exercise book to Seesaw m4v from Digital Roadtrip on Vimeo.